Come to the Technology Services Desk on the 1st floor of the library or call the ITD help desk at 615-898-5345 if you are unable to connect using the instructions below. Upon opening an internet browser (IE, Chrome, Firefox, etc), you will redirected to the MTSU Network Registration page. Log in with your Pipeline username and password for complete network access, or select Guest access. Guest access is limited to one day, after which the device needs to be registered again. Guest access does not provide access to most MTSU networked resources. For Windows users, this will require the download and installation of the Enterasys NAC Agent, a small piece of software that helps ensure the computer meets acceptable security configurations. If you are still unable to connect, you may need to update or install an anti-virus program. There are several free antivirus programs available on the web. Microsoft Security Essentials is one example. If you have any problems with wireless access, come to the Library Technology Services desk on the 1st floor or call us at 615-898-5666. You may also call the campus ITD help desk at 615-898-5345. 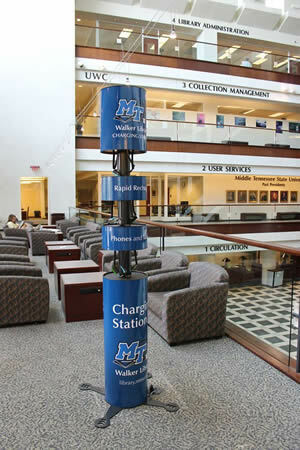 Rapid charging stations for tablets and phones are located near Tech Services on the 1st floor and on the 2nd floor balcony. These towers will give you a 30% charge in about 5 minutes.